The District 1-6A Championship included many great performances including four city best times and distances. *For the second week in a row, Franklin’s Omajuwa Etiwe, improved on his city best 200 dash last week, racing to a 21.47. *Franklin’s Zacarias Velasquez tied Parkland’s Deion Hankins mark in the long jump with a leap of 21-feet, 11-inches. *Franklin’s 800-relay team of Chris Martinez, Angel Jurado, Joshua Massaquoi, and Ian Tharp ran a 1:29.04. *Coronado’s Liam Walsh posted a 1:54.97 800-meter time. *Mt. View’s Esteban Pena tossed the discuss 161-feet, 1 inch. Discus: 1, Esteban Pena, Mt. 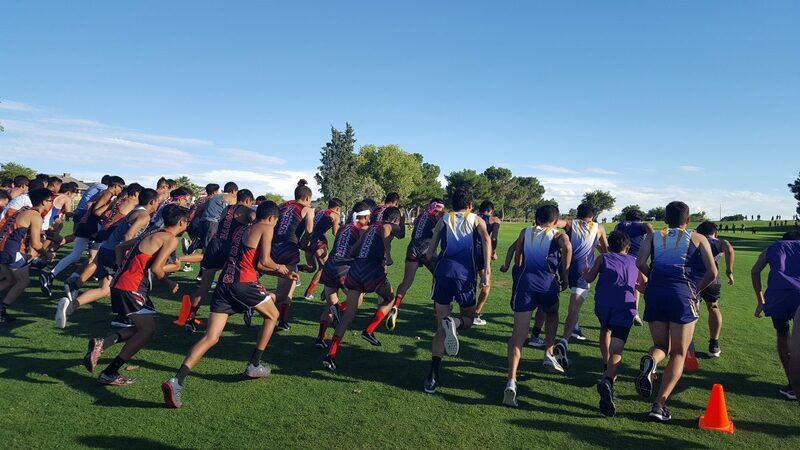 View, 161-feet, 1 inch; 2, Johnny Cerros, Franklin 158-0; 3, Misael Oriz, Socorro, 157-4; 4, Andrews Bristol, Franklin, 154-4; 5, Devean Deal, Pebble Hills, 152-10; 5, David Moreno, Jefferson 152-10; 7, Zachary Cyrus Pomele, Pebble Hills, 150-4; 8, David Moreno, Coronado, 149-2; 9, Adam Vick, Franklin, 139-7; 10, Dominque Valera, Coronado, 141-6.. Shot put: 1, Misael Ortiz, Socorro, 53-1.5; 2, Garrett Strokes, Burges, 52-11; 3, Jonathan Lopez, Montwood, 50-5; 4, David Moreno, Jefferson, 48-9.5; 5, Arturo Jimenez, Horizon, 48-4; 5, Johnny Cerros, Franklin 48-4; 7, Andrew Bristol, Franklin, 48-00.50; 8, Alex Freeman, Burges, 47-10; 9, Dominque Valera, Coronado, 47-7; 10, Nick Kim, Americas, 46-11.5. High jump: 1, Caleb Gerber, Pebble Hills, 6-8; 2, Christian Matamoros, Burges, 6-4; 2, Evan Chisolm, Americas, 6-4; 4, Ethan Villa, Austin, 6-2; 5, Bryan Suarez, Chapin, 6-0; 5, Alec Villa, Hanks, 6-0; 5, Ozzy Araiza, Ysleta, 6-0; 5, Matthew Flowers, Canutillo, 6-0; 5, Adrian Donacio, Eastlake, 6-0; 5, Dayton Jamierson, Pebble Hills, 6-0; 5, Ivann Alvarez, Americas, 6-0. Pole vault: 1, Keith Rodriguez, Eastlake, 14-0; 2, Matthew Sanchez, Coronado, 13-8; 3, Grant Levesque, Coronado, 13-6; 4, Armando Villa, Americas, 12-6; 4, Daniel Larios, Coronado, 12-6; 4, Daniel Cardenas, Mt. View, 12-6; 7, Luis Holguin, Burges, 12-0; 8, Evan Perez, Hanks, 11-6; 8, Angel Escalera, Parkland, 11-6; 8, Alan Garcia, Mt. View, 11-6; 8, David Rodriguez, San Elizario, 11-6. Long jump: 1, Zacarias Velasquez, Franklin, 21-11; 1, Deion Hankins, Parkland, 21-11; 3, Daniel Rivera, Horizon, 21-4; 4, Hector Nevarez, Mt. View, 21-3; 5, Duane Nelson, El Dorado, 21-1; 6, Takeem Thomas, Eastwood, 21-0; 6, Donta Hayes, Parkland, 21-0; 8, Karch Gardiner, Del Valle, 20-11; 9, Gilbert Rodriguez, Mt. View, 20-9.5: 10, Elijah Davis, Pebble Hills, 20-8; 10, Derek Saldivar, Americas, 20-8. Triple jump: 1, Gabriel Stonewall, Franklin 46-3; 2, Takeem Thomas, Eastwood, 44-11; 3, Kamuel Sloan, Franklin, 44-9; 4, Julian Hinojos, Americas, 43-10; 5, Donta Hayes, Parkland, 43-1.50; 6, Daniel Rivera, Horizon, 43-1; 7, Quayvon Jones, Chapin, 42-5; 8, Mario Gould, Franklin, 42-4; 9, Alec Marenco, Burges, 41-11; 10, Alec Villa, Hanks, 41-6.5. 100 meters: 1, Caleb Gerber, Pebble Hills, 10.81; 2, Omajuwa Etiwe, Franklin, 10.86; 3, Oscar Lozano, Franklin, 10.92; 4, Abel Cervantes, Americas, 10.93; 5, Fred Hernandez, Socorro, 11.03; 6, Cedric Haynes, El Dorado, 11.07; 7, Chris Ramos, Montwood, 11.08; 8, Deion Hankins, Parkland, 11.16; 9, Isaiah Davis, Pebble Hills, 11.19; 10, Duane Nelson, El Dorado, 11.22; 10, Elias Medel, Ysleta, 11.22. 200 meters: 1, Omajuwa Etiwe, Franklin, 21.47; 2, Isaiah Davis, Pebble Hills, 21.81; 3, Abel Cervantes, Americas, 21.98; 4, Kameron Walker, Austin, 22.18; 4, Caleb Gerber, Pebble Hills, 22.18; 6, Julian Mendoza, Hanks, 22.37; 7, Angel Jurado, Franklin, 22.44; 8, Julian Hinojos, Americas, 22.48; 9, Ian Tharp, Franklin, 22.49; 10, Joshua White, Burges, 22.54. 400 meters: 1, Omajuwa Etiwe, Franklin, 48.18; 2, Joshua White, Burges, 48.32; 3, Julian Hinojos, Americas, 49.40; 4, Michael Abeyta, Hanks, 49.90; 5, Abel Cervantes, Americas, 49.98; 6, Ian Tharp, Franklin, 50.06; 7, Ethan Villa, Austin, 50.24; 8, Joshua Gonzalez, Mt. View, 50.61; 9, Jakob Rangel, Franklin, 50.80; 10, Sam Zambrano, Burges, 51.12. 800 meters: 1, Liam Walsh, Coronado, 1:54.97; 2, Alan Alba, Coronado, 1:55.60; 3, Matthew Lindsey, Montwood, 1:55.66; 4, Jacob Ye, Americas, 1:55.97; 5, Fernando Morales, Franklin, 1:56.70; 6, Fernando Morales, Franklin, 1:56.81; 7, Noah Yeager, Burges, 1:57.22; 8, Sam Zambrano, 1:57.78; 9, Tyler Rodriguez, Americas, 1:57.99; 10, Kevin Campbell, Americas, 1:58.38. 1,600 meters: 1, Brandon Seagreaves, Cathedral, 4:17.56; 2, Edwin Gomez, San Elizario, 4:18.75; 3, Liam Walsh, Coronado, 4:19.86; 4, Sam Zambrano, Burges, 4:23.39; 5, Michael Abeyta, Hanks, 4:23.72; 6, Tyler Rodriguez, Americas, 4:24.99; 7, Alan Alba, Coronado, 4:26.55; 8, Jacob Ye, Americas, 4:26.61; 9, Nick Gonzalez, Coronado, 4:27.14; 10, Elias Perez, Eastwood, 4:27.20. 3,200 meters: 1, Edwin Gomez, San Elizario, 9:17.44; 2, Elias Perez, Eastwood, 9:22.36; 3, Sergio Leon Cuartas, Eastwood, 9:26.95; 4, Brandon Seagreaves, Cathedral, 9:32.02; 5, Rodger Rivera, Hanks, 9:42.32; 6, Nick Gonzalez, Coronado, 9:42.54; 7, Kayn Quinones, Eastwood, 9:42.88; 8, Tyler Rodriguez, Americas, 9:44.31; 9, Israel David, Eastlake, 9:44.97; 10, Michael Abeyta, Hanks, 9:45.66. 110 meter hurdles: 1, Dominic Britton, Chapin, 14.69; 2, Infante Jones, Parkland, 14.73; 3, Grant Levesque, Coronado, 15.13; 4, Donta Hayes, Parkland, 15.37; 5, Joshua Massaquoi, Franklin, 15.38; 6, Caleb Stewart, Americas, 15.40; 7, Chris Martinez, Franklin, 15.44; 8, Stephen Carreto, Franklin, 15.48; 9, Joshua Love, Montwood, 15.50; 10, Jacob Luna, Eastwood, 15.51. 300 meter hurdles: 1, Infante Jones, Parkland, 39.27; 2, Chris Martinez, Franklin, 40.83; 3, Joshua Massaquoi, Franklin, 40.60; 4, Vince Armendariz, Americas, 40.65; 5, Alex Colmenero, Parkland, 40.95; 6, Jacob Luna, Eastwood, 41.00; 7, Jonathan Plascencia, Jefferson, 41.35; 8, Dominic Britton, Chapin, 41.46; 9, Izak Jimenez, Montwood, 41.70; 10, Jesus Rocha, Clint, 41.72. 400 meter relay: 1, Americas (Armando Villa, Abel Cervantes, Ryan Acosta, Julian Hinojos), 43.03; 2, Andress, 43.26; 3, Pebble Hills (Caleb Gerber, Jim Edward, Jalen Partida, James Hadnot), 43.36; 3, Montwood (Chris Ramos, David Niebla, Carlos Cisneros, Ryan Rodriguez), 43.36; 5, El Dorado (Duane Nelson, Ricky Espinoza, Alex Milian, Cedric Haynes), 43.46; 6, Franklin (Devyn Clark, Angel Jurado, Jorge Beard, Oscar Lozano), 43.62; 7, Ysleta (Joshua Lopez, Elias Medel, Giovanni Martinez, Damian Carrasco), 43.98; 8, Eastwood, 44.06; 9, Parkland, 44.24; 10, Mt. View, 44.41. 800 meter relay: 1, Franklin (Chris Martinez, Angel Jurado, Joshua Massaquoi, Ian Tharp), 1:29.04; 2, Americas (Ryan Acosta, Abel Cervantes, Julian Hinojos, Armando Villa), 1:29.53; 3, Pebble Hills (Isaiah Davis, Ian Edward, Sebastian Ochoa, Galeb Gerber), 1:30.37; 4, Austin (Moises Morales, Kameron Walker, Miguel Vazquez, Kevin Usera), 1:31.17; 5, Hanks, (Samuel Guitterez, Ivan Regalado, Joey Padilla, Julian Mendoza), 1:31.65; 6, Eastwood (Marcus Ransom, Scott Stone, Larry Baker, Takeem Thomas), 1:31.87; 7, Eastlake (Antony Donacio, Adam Herrera, D’Andre Ray, Michael Garcia), 1:32.09; 8, Montwood (Ryan Rodirguez, Carlos Cisneros, Brandon Williams, David Niebla), 1:32.24; 9, Parkland, 1:32.66; 10, El Dorado 1:32.91. 1,600 meter relay: 1, Franklin ‘A’ (Ian Tharp, Ethan Bustillos, Fernando Morales, Omajuwa Etiwe), 3:21.37; 2, Americas ‘A’ (Ryan Acosta, Julian Hinojos, Armando Villa, Abel Cervantes), 3:21.40; 3, Burges, 3:24.74; 4, Parkland, 3:27.63; 5, Montwood (Brandon Williams, Matthew Lindsey, Max Ayala, Chris Rodriguez), 3:28.88; 6, Eastlake (Kevin Aravelo, Lorenz Smith, David Christobal, Michael Garcia), 3:29.14; 7, Coronado (Lyn Malcomb, Andre Corral, Liam Walsh, Alan Alba), 3:30.54; 8, San Elizario (Alex Devora, Alexis Maldonado, Tony Diaz, Alexis Gurrola), 3:30.59; 9, Austin (Steven Montoya, Miguel Vazquez, Andrik Zamora, Ethan Villa), 3:30.89; 10, Cathedral, 3:32.99.